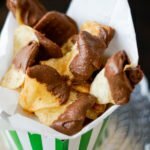 What do you get when you combine the salty crunch of a potato chip with the classic combination of chocolate and peanut butter found in Reese’s Peanut Butter Cups? You get the perfect mix of sweet and salty, and the perfect snack companion for sports and parties. Unwrap the Reese’s Peanut Butter Cup Miniatures and place them into a saucepan. Over medium-to-low heat, stir constantly until chocolate and peanut butter are fully melted. Remove from heat, and dip chips into the melted Reese’s Peanut Butter Cup Miniatures one-by-one. Place chips in a single layer on a parchment-lined cookie sheet. Place cookie sheets in refrigerator and chill for 15 minutes (or until chocolate has hardened). Serve immediately or store in an airtight container in the refrigerator for up to one week.